"I don’t mean to get too technical, but crisp poplin takes both white and pattern better, thanks to the tight weave. Think of it as high-resolution image for shirts." "Shirt made from lightweight, breathable and cool 100% cotton poplin." Custom sleeve length: Custom length 28" 28.5" 29" 29.5" 30" 30.5" 31" 31.5" 32" 32.5" 33" 33.5" 34" 34.5" 35" 35.5" 36" 36.5" 37" 37.5"
Poplin is a strong cotton weave due to its closely woven warp and weft threads. This is our lightest and most breathable weave. Poplin shirts are ideal worn under a suit, even in warmer weather. If you're not sure what weave to choose, poplin is the safest option. 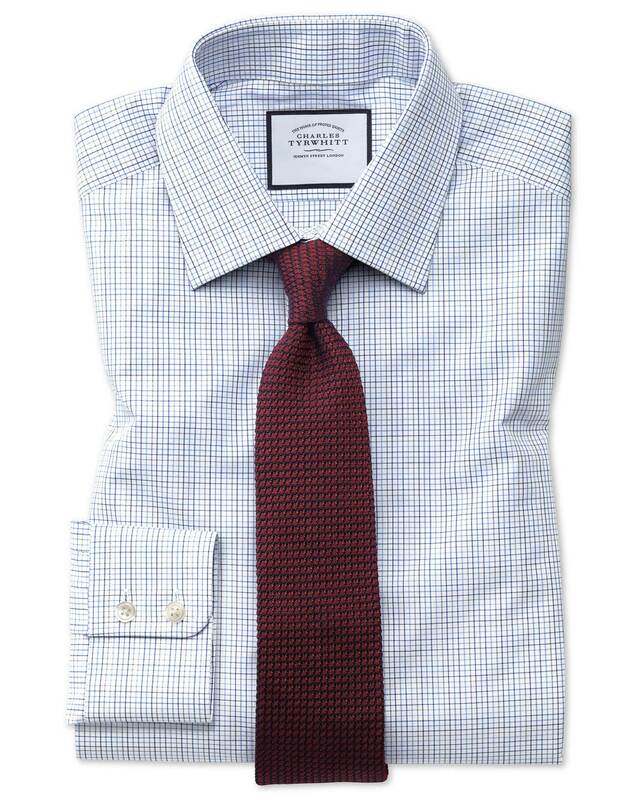 Response from Charles Tyrwhitt: I'm sorry to see this shirt wasn't quite to your liking. As beautiful as it is, I'm afraid it isn't non-iron - as you have spotted. A good tip for the future is that Egyptian cotton (due to it being very soft and delicate) can't be non-iron, so I would recommend avoiding these shirts in future when looking for non-iron. Additionally, only shirts with the words "non-iron" in their name are such. We'll gladly accept it back from you under our no quibble 6-month guarantee. Shirts too big. Can't get the sleeve length I need in my own size. Response from Charles Tyrwhitt: While we certainly do offer shirts in your usual size (15.5/35), I can see you were ordering on this occasion from the Clearance/Sale section. As a result, stock is very limited, being from a previous season, so not all sizes will still be available. Please don't hesitate to return these shirts to us if they won't be enjoyed at the larger size. We currently have 93 shirts available within the Clearance section in your size and fit, so I hope you will be able to find suitable alternatives for an exchange. Response from customer: It was 15.5/36 that I didn't find,, but nevermind it was worth the try. I'll return these ones and get some 15.5/36 when I find some that I like. Response from Charles Tyrwhitt: Many thanks for your response and for clarifying the size required. We certainly do offer shirts in 15.5/36, so I hope you will be able to find a number of these which appeal to you. Rest assured, we will be sure to process your return as swiftly as possible once it has been logged online at www.ctshirts.com/rebound. Response from Charles Tyrwhitt: We are sorry to learn that your order went astray on its way to you and for the disappointment this caused. We do allow 5 additional days past the estimated delivery date to allow for any delays that may have been incurred during transit. If the order has still not arrived, simply let us know and we shall arrange for either a replacement order or a full refund. I am pleased to see your refund was processed as requested and I do hope to see you back soon so we can restore any lost faith in Charles Tyrwhitt. Very good shirt, but I wanted it to be more non-iron. It wrinkled easily.